Douglas Southall Freeman was born May 16, 1886 in Lynchburg, Virginia, to Bettie Allen Hamner and Walker Burford Freeman, an insurance agent who had served four years in Robert E. Lee's Army of Northern Virginia. From childhood, Freeman exhibited an interest in Southern history. In Lynchburg, his family lived at 416 Main Street, near the home of Confederate general Jubal Early. The family moved to the former Confederate capital of Richmond, Virginia in 1892 at the height of the monument commemoration movement that memorialized Virginia's Robert E. Lee, J.E.B. Stuart, and Thomas "Stonewall" Jackson. In 1904, Freeman was awarded an AB degree from Richmond College, where he had been a member of the Phi Gamma Delta fraternity. In 1908, at the age of 22, he earned a PhD in history at Johns Hopkins University in Baltimore. Unable to secure a position in academia, Freeman joined the staff of the Richmond Times-Dispatch in 1909 and, in 1915, at the age of 29, he became editor of The Richmond News Leader—a position he held for 34 years. In 1911, Freeman came into possession of a cache of long-lost wartime communications between Robert E. Lee and Confederate president Jefferson Davis. Freeman spent four years working on the documents, and in 1915, he published Lee's Dispatches. The book was received enthusiastically by Civil War historians, and it became an important primary source for Civil War scholars. Written between June 2, 1862 and April 1, 1865, Lee's letters to Davis revealed the general's strategy with clearer perspective, shed new light on some of Lee's decisions, and underscored his close and always co-operative relationship with Davis. In his Introduction, Freeman summarized seven major revelations contained in the letters. For example, the letters reveal that the Confederate high command in 1862 considered but rejected a bold proposal to strengthen Stonewall Jackson's army in the Shenandoah Valley and embark on a vigorous offensive campaign against the North, even at the expense of defending Richmond. Following the immediate critical success of Lee's Dispatches, Freeman was approached by New York publisher Charles Scribner's Sons and invited to write a biography of Robert E. Lee. Freeman accepted but chose to retain his position at The Richmond News Leader and work longer days to work on the biography. Freeman's research of Lee was exhaustive. He evaluated and cataloged every item about Lee, and he reviewed records at West Point and the War Department and material in private collections. In narrating the general's Civil War years, he used what came to be known as the "fog of war" technique, providing readers only the limited information that Lee himself had at a given moment. That helped convey the confusion of war that Lee experienced as well as the processes by which Lee grappled with problems and made decisions. R. E. Lee: A Biography was published in four volumes in 1934 and 1935. In its book review, The New York Times declared it "Lee complete for all time." Historian Dumas Malone wrote, "Great as my personal expectations were, the realization far surpassed them." In 1935, Freeman was awarded the Pulitzer Prize for his four-volume biography. Freeman's R. E. Lee: A Biography established the Virginia School of Civil War scholarship, an approach to writing Civil War history that concentrated on the Eastern Theater of the war, focused the narrative on generals over the common soldier, centered the analysis on military campaigns over social and political events, and treated his Confederate subjects with sympathy. This approach to writing Civil War history would lead some critics to label Freeman a "Lost Cause" historian, an allusion to the literary and intellectual movement that sought to reconcile the traditional white society of the South to the defeat of the Confederate States of America. Following the critical success of R. E. Lee: A Biography, Freeman expanded his study of the Confederacy with the critically acclaimed three-volume Lee's Lieutenants: A Study in Command, published in 1942, 1943, and 1944. It presents a unique combination of military strategy, biography, and Civil War history, and it shows how armies actually work. Published during World War II, it had a great influence on American military leaders and strategists. A few months after the conclusion of the war, Freeman was asked to join an official tour of American forces in Europe and Japan. Lee's Lieutenants: A Study in Command established Freeman as the preeminent military historian in the country, and led to close friendships with United States generals George Marshall and Dwight D. Eisenhower. After completing his exhaustive studies of Lee, his generals, and the Confederate war effort, Freeman started work on a biography of George Washington. Applying the same approach of exhaustive research and writing narrative based on objective fact, Freeman completed the first two volumes, titled Young Washington, in 1948. The following year, he retired from journalism in order to complete his monumental work on Washington. George Washington Volume 3: Planter and Patriot and George Washington Volume 4: Leader of the Revolution were published in 1951. The following year, he published George Washington Volume 5: Victory with the help of France (1952). Freeman completed work on George Washington Volume 6: Patriot and President just before he died; it was published after his death in 1954. The concluding book, George Washington Volume 7: First in Peace, was written by Freeman's associates, John Alexander Carroll and Mary Wells Ashworth, based on Freeman's original research and was published in 1957. Freeman's considerable literary achievements have overshadowed his career as editor of The Richmond News Leader. Between 1915 and 1949, he wrote an estimated 600,000 words of editorial copy every year. He earned a national reputation among military scholars for his analyses of operations during World War I and World War II. His editorials expressed a moderate approach to race relations, and in his editorials opposed the Byrd Organization—a powerful statewide Democratic political machine run by United States Senator Harry F. Byrd. Freeman retired as editor of The Richmond News Leader on June 25, 1949. Years later, his obituary published in his former newspaper captured the scope of his editorial interests. He must have written close to 600,000 words a year, campaigned for the Federal Reserve Act, for abolition of the old City Administration Board, for repeal of the fee system, for establishment of the battlefield parks, for Richmond's new charter ... Among the legacies he left to us here on the paper were his "Seventy Rules for Good Writing" ... he put brevity just behind accuracy in his list of virtues. In addition to his forty-year career in journalism, Freeman became one of the first radio analysts, in 1925. His twice-daily radio broadcasts helped make him one of the most influential men in Virginia. From 1934 to 1941, he commuted weekly by air to New York City to teach journalism at Columbia University. He also taught as a lecturer at the United States Army War College for seven years, and served as Rector of the University of Richmond. Freeman's work ethic was legendary. Throughout his life, he kept a demanding schedule that allowed him to accomplish a great deal in his two full-time careers, as a journalist and as a historian. When at home, he rose at three every morning and drove to his newspaper office, saluting Robert E. Lee's monument on Monument Avenue as he passed. Twice daily, he walked to a nearby radio studio, where he gave news broadcasts and discussed the day's news. After his second broadcast, he would drive home for a short nap and lunch and then worked another five or six hours on his current historical project, with classical music, frequently the work of Joseph Haydn, playing in the background. Freeman was a devout Baptist who prayed daily in the small chapel he built in his home. He acknowledged that his Christian faith played a central role throughout his life. Freeman was also a Virginian, and described himself as "deeply rooted in the soil of old Virginia." He believed in the importance of continuity, even in personal geography, once writing, "I think the American people lose a large part of the joy of life because they do not live for generations in the same place." Freeman believed in the importance of a character. His definition of leadership was, "Know your stuff, be a man, look after your men." Freeman married Inez Virginia Goddin on February 5, 1914. They had three children: Mary Tyler, Anne Ballard, and James Douglas. Mary Tyler Freeman married Leslie Cheek, Jr., longtime director of the Virginia Museum of Fine Arts, and became a founder or influential officer of several important community organizations, as well as president of the Robert E. Lee Memorial Foundation. The family lived (and Freeman died) in a mansion he named "Westbourne" in Richmond's west end, a house listed (in 2000) in the National Register of Historic Places. Douglas Southall Freeman died of a heart attack on June 13, 1953 at his home in Richmond, Virginia, at the age of 67. He was buried in Hollywood Cemetery in Richmond. Freeman's newspaper editorials and daily radio broadcasts made him one of the most influential Virginians of his day, his analysis of World War I and World War II military campaigns bringing him recognition throughout the country, especially in military circles. President Franklin Delano Roosevelt thanked him for suggesting the use of the term "liberation," rather than "invasion," of Europe. Military commanders such as Admiral Chester W. Nimitz and Generals George Marshall, Douglas MacArthur, and Dwight D. Eisenhower sought his friendship and advice. Eisenhower said Freeman first convinced him to think seriously about running for the presidency. 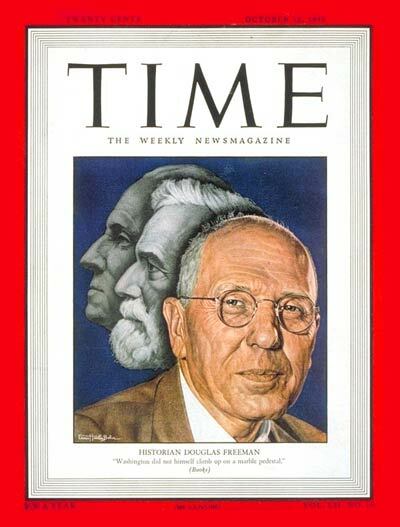 In 1958, Freeman was posthumously awarded his second Pulitzer Prize for his six-volume biography of George Washington. In 1955, the Virginia Associated Press Broadcasters honored Freeman by creating the Douglas Southall Freeman Award for public service in radio journalism. Some modern historians, such as Eric Foner, however, have taken a more critical view of Freeman's scholarship. Foner calls Freeman's biography of Lee a "hagiography" and criticizes the lack of nuance and lack of attention that was paid to Lee's relationship to slavery. ^ a b c d e f g h i j k Johnson, David. "Douglas Southall Freeman (1886–1953)". Encyclopedia Virginia. Retrieved November 1, 2011. ^ a b "Douglas Southall Freeman Marker Q-6-17". Marker History. Retrieved November 4, 2011. ^ Freeman, Douglas Southall. Introduction in Lee's Dispatches. New York: G. P. Putnam's Sons, 1915, pp. iii–xxxviii. ^ a b Taylor, John M. "Lee's biographer is a story himself; Richmond News Leader editor's books extensively documented" in The Washington Times, July 2, 1927. Goliath. Retrieved November 5, 2011. ^ Gallagher, Gary.Jubal A. Early, the Lost Cause, and Civil War History: A Persistent Legacy. Marquette University Press, 1995. ISBN 0-87462-328-6. ^ a b c d e f Mullen, Richard. "America's Greatest Biographer: Douglas Southall Freeman". Contemporary Review (Resource Library). Retrieved November 4, 2011. ^ a b c "A Guide to the Douglas Southall Freeman Papers 1900–1955". University of Virginia. Retrieved November 5, 2011. ^ a b c Johnson, David. Douglas Southall Freeman. Gretna, Louisiana: Pelican Publishing Co., 2002. ^ Fryer, Bronwyn (March 1, 2008). "Timeless Leadership". Harvard Business Review. Retrieved January 14, 2019. ^ "Mary Tyler Freeman Cheek McClenahan". Library of Virginia. Retrieved November 5, 2011. ^ Unknown (October 18, 1948). "The Virginians: Douglas Southall Freeman, Washington, and Lee". Time. New York. Archived from the original on November 11, 2014. Retrieved 2014-11-10. ^ "Va. AP Honors WRNL, WSVS For Public Service in Radio". Broadcasting. November 14, 1955. Retrieved January 17, 2015. ^ Foner, Eric. "The Making and the Breaking of the Legend of Robert E. Lee". The New York Times. Retrieved September 18, 2017. ^ "Douglas S. Freeman Wins Award For News Commentary". Kingsport News. April 6, 1951. p. 3. Retrieved March 22, 2015 – via Newspapers.com. ^ "Douglas Southall Freeman (1886–1953)". Library Thing. Retrieved November 1, 2011. Cheek, Mary Tyler Freeman. "Reflections" in Virginia Magazine of History and Biography 1986 94(1): 25–39. ISSN 0042-6636. Freeman, Douglas Southall. R. E. Lee: A Biography (4 volumes). New York: Charles Scribner's Sons, 1934. Johnson, David E. Douglas Southall Freeman. Pelican Publishing, 2002. ISBN 978-1-58980-021-2. Smith, Stuart W. Douglas Southall Freeman on Leadership. White Mane, 1993. ISBN 978-0-942597-48-6. This page was last edited on 9 February 2019, at 23:23 (UTC).